This is the second of a three-part series on students who have created products for sale. If you have perused the shelves of the Matthews Library, you may have noticed a book by a familiar author: “Galactica” by junior Rebecca Waterson. In sixth grade, Waterson published the book for a class at Swope Middle School in Reno, Nevada, that required students to make a product by the end of the year. Inspired by her love of the “Percy Jackson and the Olympians” book series, Waterson tried making a sci-fi graphic novel, but after her father saw how much dialogue she was cramming into the panels, he suggested she write a book instead. She converted her comic book idea into a five-page story, proudly delivering it to her parents to be published. She finished “Galactica” — 136 pages this time — about a month before the end of school, and her mother published it through Amazon. Available in paperback for $7.99, the book earns Waterson about $1 per copy, she said; about 100 copies have been sold. “It’s really fun to see your own work on this big website with a whole bunch of well-known books,” Waterson said. On the last day of sixth grade, Waterson gave copies of “Galactica” to her teachers. “I’ve enjoyed being able to bring up that I wrote a book with English teachers,” Waterson said. “When I first told (late English teacher Lauren) LaMay, she freaked out. She ended up getting the book, and she put it in her room. Writing “Galactica” taught Waterson about her writing style and gave her an appreciation for authors. Although she lost interest in writing a sequel, Waterson is brainstorming other book ideas and is trying to animate the first scene in “Galactica” using Adobe Animate. But she isn’t the only young Cavalier author. 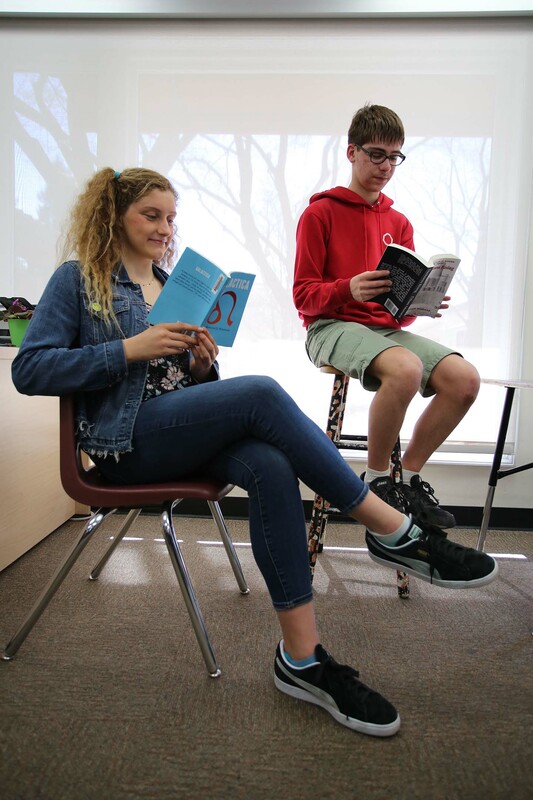 Freshman Ethan Monasa published the first book in his second series on Feb. 2. He self-published his first series — “The Peace Chronicles,” a tetralogy he started in fourth grade and finished in about three years — through Lulu Press at the recommendation of former fifth-grade teacher Amy Velder. “I didn’t make my first series available to the public because I didn’t feel ready or confident enough,” Monasa said. “That was definitely a good decision because it was terrible. The story was solid, but the execution was terrible, especially the pacing. That’s the sort of thing that improves every time I write. Compelled by his love of writing, Monasa began planning his new fantasy trilogy, “The Tales of Anmorn,” 2 1/2 years ago and spent two years writing the first book, “Darkness Rising.” Monasa said he started the process with his own broad ideas and concepts from books he loved before connecting the dots and brainstorming smaller plot points. In preparation for writing his second series, Monasa read books about aspects of creating novels, such as character and plot design. “It helps me see a lot of similarities in the books I read,” Monasa said. The “Darkness Rising” paperback version is a 455-page read, and Monasa estimates that the other books will have similar lengths and take him the rest of high school to finish. “Darkness Rising” can be purchased in paperback ($10.99) and Kindle ($4.99) versions. Self-publishing took weeks to complete due to Amazon’s guidelines. He didn’t have an editor, illustrator or agent because of the expense. “I’m not expecting to make much, so I’m not ready to invest money into the process until I think it’s financially worth it,” Monasa said. “With my book’s length, it would cost thousands of dollars to get a team of reasonable quality. Profits are small, with only 28 cents and $3.35 earned for each paperback and Kindle version bought, respectively, according to Monasa. So far, the readership of “Darkness Rising” consists of Monasa’s family and friends.